Holy cow! This is the most extensive conceptual design package I have ever seen. One thing I can always count on in these reviews is that the Farr office will send me top-notch design drawings and not just advertising department renderings. I like to see what the actual designers drew. I can read drawings. I can see what is happening with a good drawing. In this case I got all of it and more: good drawings, lovely sketches and renderings, a bill of materials, copious graphs showing how the boat fits into the IRC fleet and even the much heard about but today seldom seen designer’s comments. I would need three pages to do this design justice. I’ll give it a shot. The idea behind this design was a competitive and stylish IRC boat that could be raced with a smaller crew than currently favored by the rating system. Striking appearance was one of the design objectives. A crew of six was another. 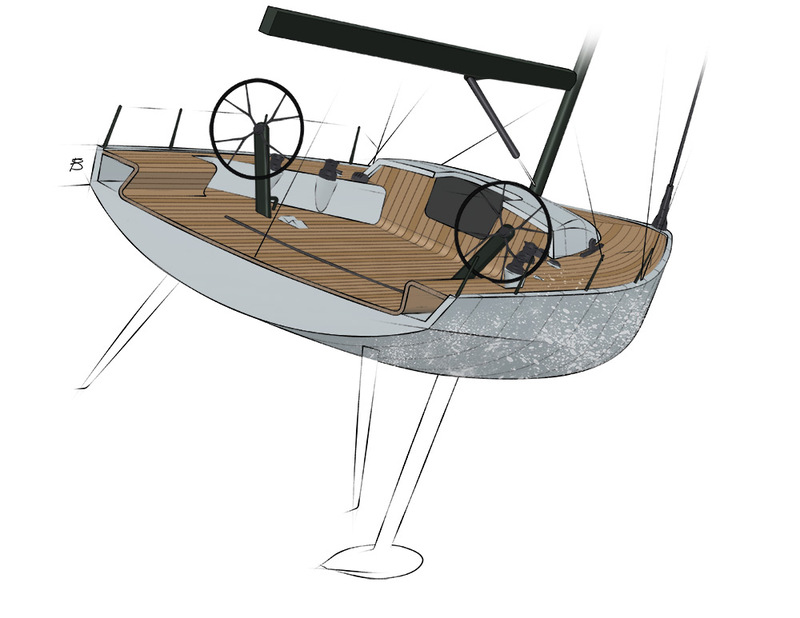 With the success of the light TP52s in what had been a class rule that favored heavier boats, the Farr office worked on developing a smaller boat that would have the same advantages of the TP52s. I have specs for two versions. One called the “IRC Optimized Baseline Design” and the other is called the “13m IRC Daysailer Racing Yacht.” So I don’t get confused, I will use the numbers for the 13m IRC Daysailer version. With a D/L of 102.8 and an L/B of 3.27 the boat is wide and medium light. The sheer is subtly reversed. The reverse curve on the bow is very distinctive while not giving up any sailing length. There is some overhang at the stern but not much. A chine starts amidships and, combined with topsides flare, will help the small crew by adding form stability. I find the sweep of the chine in profile quite interesting and the notes say the chine line was developed with computational fluid dynamic studies. There is no taper to the deck in plan view once it has reached max beam. This is to provide the maximum righting moment from the small crew especially off the wind when crew weight will move aft. There are twin rudders and a T-fin and bulb keel with a draft of 9 feet 4 inches. On the non-optimized model the keel is lifting. On the optimized model it is fixed. Reading the notes on the hull form, the Farr office says pretty much everything the other race design offices say. But when I consider the history and pedigree of the Farr office I’m inclined to say, “Yes, I believe. I truly believe.” I think that even if this design were not spot on it would be close enough to be a winner. I won’t say much about the interior. There is a continuous long line of berths port and starboard. Maybe they are just settees. There is a V-berth with a head tucked underneath. There are quarterberths. I do not see a galley or a nav station. This is not a mom-and-pop cruiser. The deck plan features a small and svelte cabintrunk with very nice contours and a huge cockpit. Essentially, the cockpit takes up half the boat. There are twin wheels with the mainsheet traveler directly aft of them. Due to the crew of six compared to the normal crew of 10 or 11 there are not enough people to operate pedestal winches and running backstays. The result is a very simple deck layout with only four winches. There are control lines for the mainsheet and mainsheet traveler exiting the sole to clutches just forward of each wheel. Along with this basic deck layout drawing, the Farr office provided a deck drawing showing four decks and where each crewmember will stand during normal jibing, mark rounding and tacking and spinnaker dousing maneuvers. I can’t find the drawing showing how crewmembers should part their hair. On the rig, the square-topped main has been eliminated in order to get rid of running backstays. The spreader sweep is 20 degrees. The SA/D is—get ready—34.69. I’d say that’s enough power to scoot you right along in light air upwind. This was a fun boat to review. I encourage you to get the whole story from the Farr office. LOA 42’8”; LWL 36’11”; Beam 13’10” ft.; Draft 9’4” ft.; Displ. 11,575 lbs. ; Ballast: 4,740 lbs. ; Sail area 1109 sq. ft.; SA/D 34.69; D/L 102.8; L/B 3.27; Auxiliary 30-hp saildrive; Fuel 8 gal.